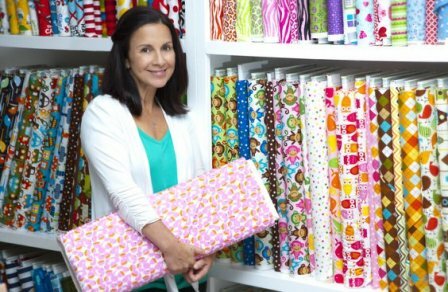 Gigi's Fabric Shop has been serving the Tampa Bay area with the highest quality sewing machines since 2013. Including Juki sewing machines and Janome sewing and embroidery machines. In addition we carry notions and designer fabrics. After becoming a grandmother at 38 and lovingly being nicknamed "Gigi" by her granddaughter the name Gigi was born. As an avid sewer, Gigi loved to sew for her family, andhas shared her love of sewing with her granddaughter since she was only two. Not soon after sharing her love of sewing with her granddaughter, Gigi decided to share it with the community around her, opening "Gigi's Fabric Shop" . Today, the shop is still going strong with over 4200 sq. ft , a friendly and knowledgeable staff, numerous classes and children's programs. Our number one goal is to have excellent customer service and provide the most satisfactory level of education for your purchased sewing machines. In the same way that Gigi began her journey by sharing her love of sewing with her family, an invitation is extended to you to come in and join her family of passionate sewers and quilters. Stop in and meet us, learn a few things, teach us something new, and join a family of sewers and quilters in the Tampa Bay area. We simply can't wait to see you. p.s. If you are in the market for a new janome or juki sewing machine don't hesitate to give me a call. I would love to sit down with you and see what sewing machine works best for you. Please take the time to research and test out machines prior to buying. We are a Janome Dealership and Juki Dealership selling quilting, sewing and embroidery machines. We can also help you with industrial sewing machines. We serve not just the Brandon- Plant City area, but also all of Tampa bay.